Category – Timber products and Information. 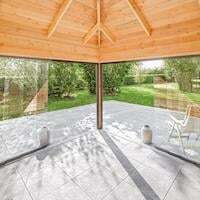 Posts relating to our timber products including technical articles and introductions to new products or further explanation of existing products. Some of us here at Tuin have recently taken a trip across the water to Tuindeco, who are based in Coevorden, Netherlands. The aim for my attendance to this trip was to learn more about Tuindeco and our business practices, so that I can gain insight as to what made them become one of the biggest competitors in the Log Cabin industry. So, after the ferry trip that consisted of napping, eating Bitterballen (Highly recommended by the way) and a drive to Coevorden, we arrive at the office of Tuindeco. Where we’re met with a large showsite and friendly employees, including the owner of Tuindeco. We were soon into discussion of the actions they implemented over the winter to ensure a successful collection of cabins ready to sell, which I’ll show you in a moment. 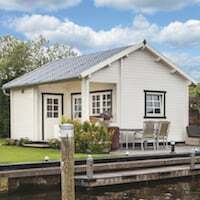 Winter can be a rough time in this business, with the sawmills running low of wood and struggling to supply it with the demand of companies wanting to restock their Cabins ready for the busy summer period. Tuindeco came up with a process that allows them to get their supply of stock, as well as keeping the sawmills going with jobs during the hard period- This starts with them buying an area of trees to be sent over to the sawmill, and hiring them to cut them into the required logs. 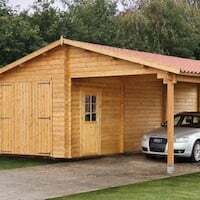 This may be an expensive way about doing this, but buy supplying our own wood to the sawmills we are then able to get a consistent supply of Log Cabins as well as keeping the workers in the sawmills in work during the quiet winter months. Allowing a fairly win-win situation for both parties. During this talk, they often mentioned about how much stock they had- making me believe that they may be over exaggerating a little… But I was soon proved wrong when we were taken around their warehouses. Their warehouses are spread across the town of Coevorden, with plans for more land into consideration. The warehouses closest to the main office were filled with Log Cabins, and, well I’ll let the images I took speak for themselves. There was hundreds of Log Cabins, all organised in their allocated sections and stacked as high as it was safe to. These pictures show just some of the many Log Cabins within the warehouse, as well as a large section dedicated to our Garden Furniture range – all ready for a quick dispatch to our customers. There was also a noticeable difference with the Log Cabins this year regarding packaging, a shrink wrap has been implemented in order to protect the cabins in order for them to be stacked as high as they are, as well as reduce the chance of water leakage into the package. The Snow White Playhouse looking protected in the new shrinkwrap packaging. If only I could share the smell of all of the fresh timber inside those warehouses, I was also delighted to see the regulation stickers on the timber as shown below. All of our timber comes from sustainable sources, trusted and approved by the regulators such as FSC, PEFC, KOMO and Indonesian Legal Hardwood. Though it may appear like a lot of timber just stacked up on top of each other, there is care put into the layout of the warehouses, with fragile items such as glass carefully stored near the corresponding items that they go with (for example, glass table tops). After seeing all of this, as well as hearing plans for them to expand even more- I am more convinced that Tuindeco will be able to successfully supply the demand of their hundreds of retailers across Europe, including us. To finish off the day, I drifted off from the business talk to explore their showsite- Much bigger than ours and stocked with some new products in the 2018 range. Here are just some of my favourite products I took pictures off, you may find more updated across the site to the corresponding product pages. At first, I wasn’t too sure when I saw the Wicker Picnic Range in the catalogue- but after seeing them in real life, they were spectacular. They’re comfy and appear to be durable for years of use – as well as being unique in their design, there aren’t many wicker/rattan picnic sets in this style on the market. 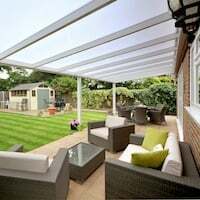 Made with Aluminum framing to prevent rusting, the rattan braiding was done straight over the framing – Made from a synthetic material in order to make their maintenance pain free. The Oakland Eight Piece Wicker Lounge Set has been tested and approved by myself for comfort levels. A great addition to any garden seating area. This Larch DIY Veranda was on our list for quality checking before preparing to list it for the UK market. With a polycarbonate roof available as well as the sliding glass panel – It certainly impressed us and hope to impress our customers too. Keep an eye out for when this will be listed in the near future! Pardon the rain in the next two photos, but the newly added entrance verandas, found in Shepherd Hut Accessories, also looked very impressive to the eye – A great way to personalise your Shepherd Hut and make a more inviting entrance to your Garden Office or Summerhouse! And these are just to list a few of what’s within their showsite – Overall, I can confirm that this was an impressive tip, from looking at the new catalogue products as well as gaining more insight of Tuindeco’s business practices- I hope this was insightful to you as well! If you’re still curious about Tuin and Tuindeco, you can read more about how we operate from our Tuin About Page as well as the Tuin and Tuindeco in Pictures blog. This is a timber treatment primarily designed for larch and oak or douglas fir. It cleans prior to a proper treatment using something like our Carefree Protect Timber Treatment …. it looks damn impressive!! I’m wondering if this will work on cleaning up a log cabin if it hasn’t been treated properly or for a long time when a cheap treatment has failed …. interesting … I will come back with findings soon. I love Larch, it has such a wonderful colour and feel to it, a really lovely hue of pinks, oranges and yellows. We’ve recently built a raised decking area on our show site incorporating Larch decking, steps and balustrade, we built it around one of the very popular Tourist Gazebos and it really has worked very well. Larch decking and balustrade incorporated into one of our standard treated pine gazebos. It looks gorgeous! Larch does not need treating but I love the colour of it and to ensure we can see it for a very long time we’ve treated it with Clear Carefree Protectant. Of course, being made from Larch you do not have to treat it, it is a very oily, resinous and dense wood that does not need any maintenance. It will weather eventually to a silvery grey and this process depends on its location, weather conditions and positioning. Of course if you would like to keep the gorgeous colour then it can be treated with a clear timber treatment as we have done. 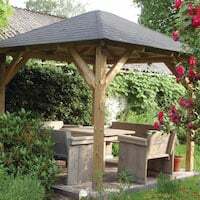 On a recent to visit Tuindeco we went through the latest products for the coming season and I was really pleased to see as well as the stunning Larch Modular Garden Building Range they are also introducing a Gazebo range, all made from Larch. 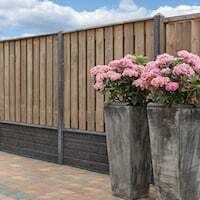 I have already ordered one and we’ll be putting it up on show soon, I’m sure sales of these will far exceed the pine ones, not only for its beauty but also its extensive longevity, strength and ease of care. 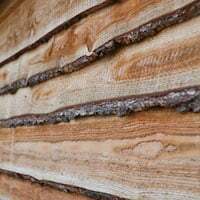 Larch is such a wonderful timber, it’s been used in construction for years and is also used with boat building, in Central Europe it has been long regarded as one of the best building timbers. It’s stronger than pine and is very popular with architects for external cladding and outdoor structures. Un-dried larch is particularly good for heavy structural work. Larch is unusual amongst the softwoods as it is deciduous and sheds its pine needles in the Autumn. It also features in Lapp and Siberian folklore as the ‘World Tree’. The smoke from burning the timber is said to ward off evil spirits and is used as protection by their Shamans as well to induce visions (not recommended). 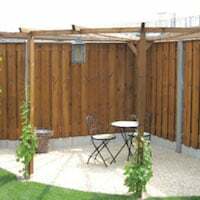 Strength and its ability to withstand constantly changing wet and dry environments is its main desirable property, couple this with its natural rot resistant properties, wonderful colour and fine texture which make it lovely to work with and enjoy in your garden. Tuindeco Larch is sourced from Western Europe – PEFC or FSC. Environmentally sound and sustainable. Being a very dense wood it can resist constant changes from wet to dry with very little distortion, warping and shrinkage once dry. It can be prone to surface splits but this does not affect the strength, longevity or durability. A strong timber and stronger than other conifers such as Spruce and Pine. It is 60% stiffer than European redwoods, 30% stronger in bending and compression, 40% harder. It does though have similar crushing and impact properties to that of pine and spruce. Larch is faintly scented and has a wonderful straight grain with small knots. It is reddish, orangy, pinky in colour with contrasting white sap rings. It has fine texture and a high definition of grain. Low maintenance and does not need treating, when allowed to weather if becomes a silvery grey colour. It is a good idea though to treat it where it is directly in contact with the ground. Larch is in the durability class of 3 – 4. Durability is the measurement of a 50mm x 50mm cross section of timber left in the ground unprotected. Class 3 is 10 – 15 years. Class 4 is 5 – 10 years. When untreated and NOT in ground contact you can expect a life of 50 – 60 years. When treated and outdoors the life expectancy is 100 years. Like everything there are some limitations and foibles that it’s worth bearing in mind when you are working with Larch. Due to its dense nature larch can split easily if you nail it without some preparation. Always drill a pilot hole before nailing or screwing to stop any splits being created. The Tannins can also react with iron and will produce and blue / black colour stain. Ideally always use non-ferrous nails and screws to guard against this. A couple of useful videos to aid in the identification of a larch tree should you wish, the first one I found particularly useful! Larch timber is available to complete any garden construction project in a huge variety of thickness, profiles and lengths. 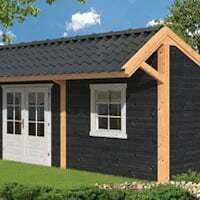 Also available is an extensive range of Larch modular buildings in both flat roof and apex roofs. 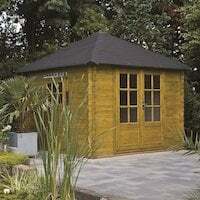 Modular Larch Garden Buildings in three main styles and a myriad of possibilities, sizes and styles. 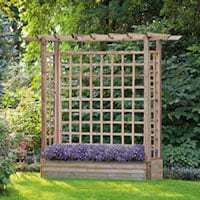 New for this season are Larch Gazebos: I can see these really taking off as these will make a stunning addition to any garden. I personally really hate a bad review, this was one but unfounded, we try our hardest to provide a top quality product with a top class service and will review everything that is said to improve where we can.Sometimes though it just comes down to understanding a product that you are buying and the expectations that match it. 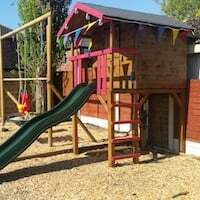 This review has prompted me to write this quick post as from this statement it is clear that customers are not realising what tanalised timber actually is: I shall explain a little about it so people can gain more understanding of what you are buying and that there are no faults at all nor “badly” carried out. Tanalised is actually a trademark, as is ‘Tanalith E’ which you will see sometimes. This brand has been around since the 1940’s. Pressure treatment is the process carried out using ‘Tanalith E’ or similar. Please note after watching the process, it is in a huge tank under a vacuum, it cannot be at fault or ‘Badly’ done. An initial light green colour. Weathers to a light honey brown. Eventually to a natural silver grey. This change of colour is not any indication of loss of preservative protection. Subsequent decorative finishes can be added to create the look you desire, you will see many examples of this across our website and catalogue. We supply fixings that will have a comparable life to the timber for many of our products but please note if timber is cut, notched, sawn etc then a comparable treatment will need to be applied to carry on protecting the timber. You can see from this picture green portions on the fence panel. This cannot be helped and is part of the pressure treatment process. You may see this on your new pergola, planter or gazebo, please expect this, it is completely normal. Wood impregnated by boiler pressure induction will become very humid while being processed. As a result, the wood can be affected by mildew and fungi, especially during the warm seasons. These visual imperfections of the product will vanish or can otherwise easily be removed by hand. Fungi do not affect the quality or strength of the wood. Since wood can swell and shrink as a natural product, the dimensions listed in the catalogue and product pages can show small deviations. Blue mold and the formation of salt crystals. This was extremely worrying and I have advised him since, but, please do not “rub down” the ‘Splashes’! Doing so will remove the protection. Removal of resin bubbles is fine with a sharp knife but do not rub down the surface. As we have learnt these are not a splash, these are the inherent properties of timber and the tanalisation process and are the cause of the copper ingredient reacting with the moisture and sap within the timber itself. Light bleaching after the tanalisation process. I have added green lines on his product to highlight it more for you. You will notice there are some lighter lines. These lines will have been caused after the pressure treatment process and during storage. Light affects timber, it cannot be helped. During storage certain parts may be covered due to packaging, positioning etc. Other parts are exposed to light. Light will start to react with the timber turning it first to brown and then to a silvery colour. Again this cannot be helped and should be expected. After a few weeks all of the new structure will reach the same colour due to light exposure.